At First Sight: Hayley is going through a lot of adjustments following the divorce of her parents, her mom being laid off work and their having to move in with her Grandmother into a tiny apartment above Gran's Tea Shop. At school, things are a little weird as her set of friends is breaking up. Her girl best friend is getting tangled with the drama crowd and ignoring Hayley; and her other best friend Marco is acting weird and it seems like Hayley can never say the right thing to him. But there is one thing that never fails Hayley: cupcakes!! Through thick and thin, Hayley takes comfort in baking and in helping out at The Tea Shop where the troubles are never bigger than getting the current batch of baking just right. Second Glance: Confectionately Yours: Save the Cupcake! was adorable you guys! Such a sweet, lovely read - and I don't say it just because Hayley shares a lot of cupcake recipes. Hayley was a great narrator, she cared about her family and wanted to do right by them but she wasn't perfect and she made mistakes, yet I always liked her - plus, her mistakes were totally age appropriate - and it was fun to see her grow up a little and come into her own. I really felt for her and all that she was going through with her parents (her dad is really clueless and he made me angry all the time he was around, though I don't think he's bad per se, and Marco and Artie. And I was so happy for her when she began to make a new friend. Bottom Line: Save the Cupcake! is one of the most adorable things I've read this year (so far) and I loved it! I loved it so much that I went online and ordered the next couple of books of the series. It's sweet and funny and, well, totes adorbs. 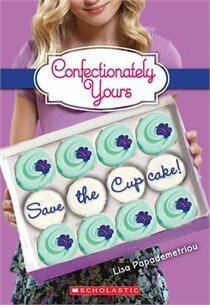 Check out John @Dreaming in Books Review of Confectionately Yours: Save the Cupcake!